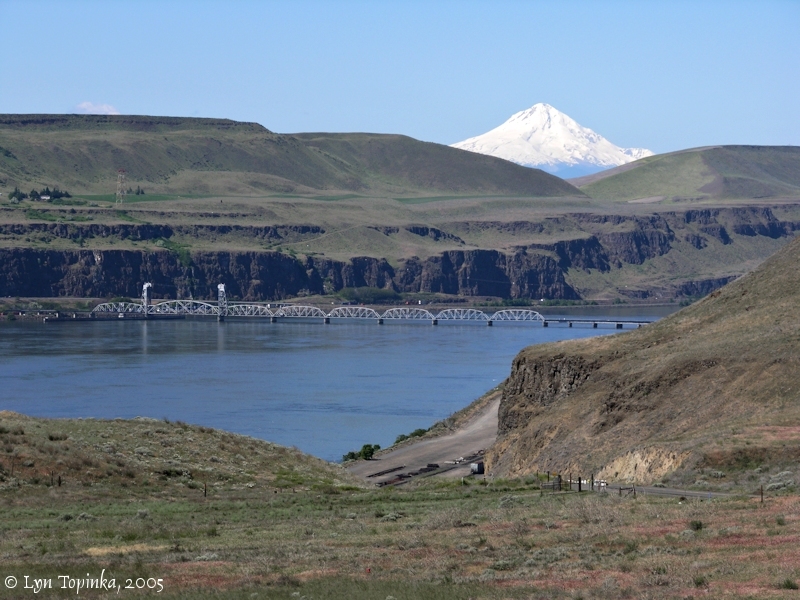 Click image to enlarge Celilo area and Mount Hood, Oregon. From Washington State Highway 14, near Haystack Butte, looking down on the Oregon Trunk Line Railroad, Celilo area. Mount Hood, Oregon, shows in the notch of the Fairbanks Water Gap. Image taken May 24, 2005. The Portland & Seattle Railway was incorporated in 1905 with the purpose of connecting Spokane, Seattle and Portland by railroad. In early 1908 the company name was changed to the "Spokane, Portland, & Seattle" (SP&S) after the railroad started construction of a line from Portland to Spokane along the north bank of the Columbia River. Meanwhile in 1906 the Oregon Trunk line was being developed in Central Oregon, and was merged into the SP&S system in 1908. The Oregon Trunk originally connected with the SP&S using boats to cross the river, until 1912, when a bridge was constructed across the Columbia River, connecting the northern SP&S line with the southern Oregon Trunk line (see "The Golden Age of Postcards" below). 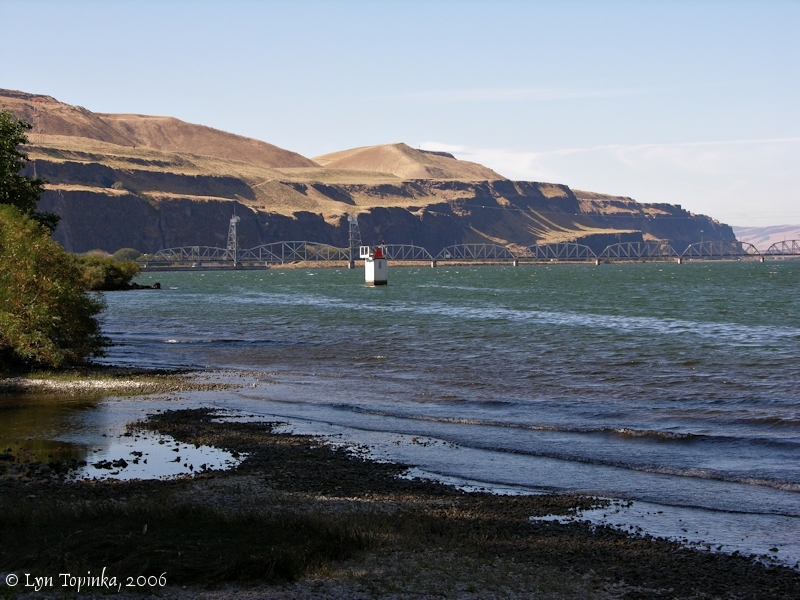 The southern end of the bridge touches the Oregon shore downstream of Celilo Park. 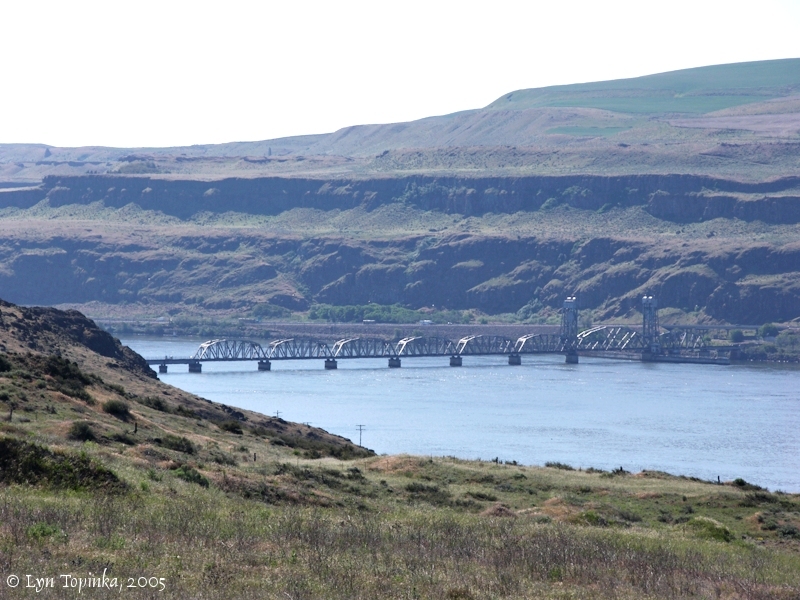 The northern end of this bridge is located just downstream of Wishram. Click image to enlarge Oregon Trunk Line Railroad Bridge, Oregon side. View from Interstate 84. Image taken October 2, 2006. 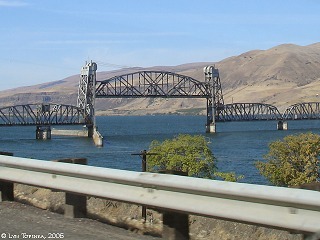 Click image to enlarge Oregon Trunk Line Railroad Bridge as seen from upstream, Washington State Highway 14. View from Washington State Highway 14 near Haystack Butte, looking down on the Oregon Trunk Line Railroad and Celilo area. Image taken May 24, 2005. Click image to enlarge Oregon Trunk Line Railroad Bridge as seen from downstream at approximate location of Lewis and Clark's campsite. 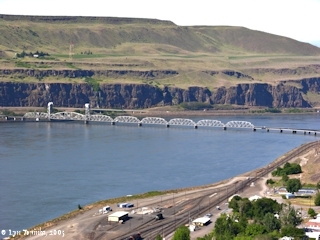 The Oregon Trunk Bridge connects the area which once was Celilo Falls with Wishram Washington. Lewis and Clark's camp of October 22 and 23 was on the downstream side of the bridge, in the foreground in this image. View from Washington State Highway 14. Image taken May 24, 2005. 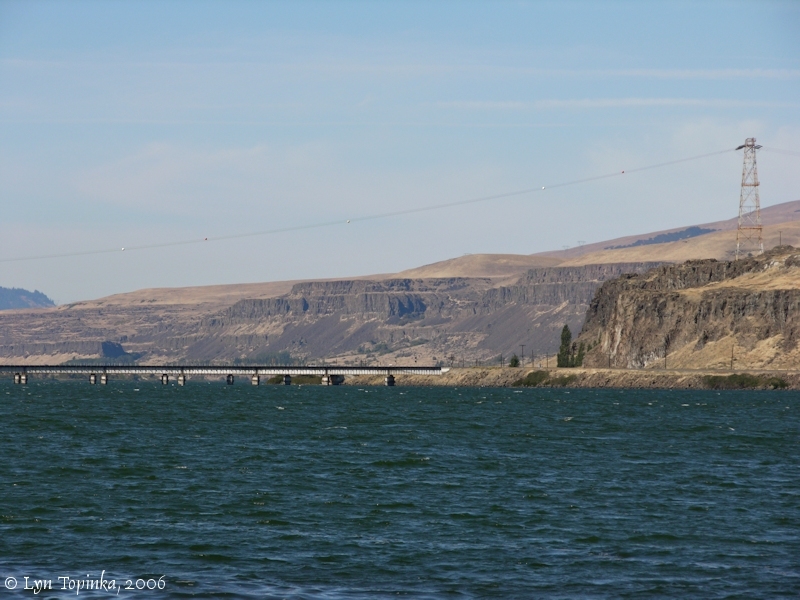 Click image to enlarge Oregon Trunk Line Railroad Bridge, Oregon side, as seen from Celilo Park. Image taken October 2, 2006. 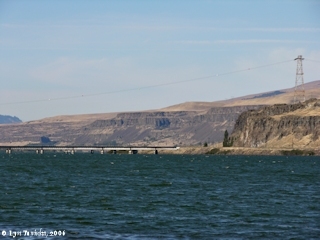 Click image to enlarge Oregon Trunk Line Railroad Bridge, Washington side, as seen from Celilo Park. Image taken October 2, 2006. Click image to enlarge Penny Postcard: Oregon Trunk Railroad Bridge and Celilo Rapids, 1914. Penny Postcard, Image copyrighted 1914, "Oregon Trunk Bridge, Across Celilo Rapids, Columbia River, Oregon.". Image copyright 1914 by Kiser Photo Co., Portland, Oregon. Published by Lipschuetz & Katz, Portland, Oregon. Card #261. In the private collection of Lyn Topinka. Click image to enlarge Penny Postcard: Christmas Card, Oregon Trunk Railroad Bridge and Celilo Rapids, ca.1914. Penny Postcard, Postmarked 1914, "Oregon Trunk Bridge Across Columbia River at Celilo Falls.". "Wishing You a Merry Christmas and Happy New Year". Published by Wesley Andrews, Baker, Oregon. Card is postmarked December 20, 1914. In the private collection of Lyn Topinka.